I began the personnel side of my career in 1980. Back then, a manager would call our labor/employee relations office and describe an employee’s conduct/behavior issue(s), usually seasoned with frustration, if not outright anger. We in HR would access the individual’s record and, based on the manager’s version of events, recommend an appropriate disciplinary response. Such actions could range from a lecture to lengthy suspension or possibly removal depending on the circumstances (Douglas factors). That was the method used 35 years ago and it hasn’t changed an iota over the decades. More importantly, over those years I’ve never encountered any evidence that this system actually works. None. I make my living presenting seminars to Federal agencies across the country. When home in Seattle, I spend time volunteering as a community mediator. Recently, I mediated two disciplinary cases. Each was familiar in tone and subject matter. One involved suspicion of sick leave abuse and the other concerned a Letter of Reprimand. Both came to mediation as a result of EEO “pre-complaints” – poised to ripen into expensive investigations and hearings. That is not an uncommon response to discipline. Each of these cases was resolved in a matter of hours and all sides left happy with the outcomes. The success of the Seattle Federal Executive Board’s (FEB) mediation program is stunning. We save government agencies in our corner of the country between $2-4 million every year by precluding the expense of grievances, EEO complaints, etc. Moreover, we don’t even try to estimate the savings attributable to morale and improved workplace relationships that so often result from productive conversations and agreements. Mediations here in the Northwest are serving that purpose. The biggest problem is that HR offices, attorneys, and the Office of Personnel Management seem unaware of how mediation has changed over the years and of how this tool might prove a less expensive and more effective alternative to the memos and suspensions in use for the past 50-100 years – before personal computers, cell phones, and a highly educated workforce. Disciplinary actions are modeled on a parental model. Suspected offenders are punished for their misdeeds. Memos (reprimands, warnings, cautions, etc.) and suspensions are management-directed responses to conduct issues. The objective of such actions is a change in behavior. In my experience, achieving that change is problematic. Just as with teenagers, the workplace punishment model offers limited assurance of future rehabilitation or changes. The experience of mediators is different. We are assisting Federal managers and employees negotiate an agreements that focus on the future rather than the past. Unlike disciplinary memos like warnings and reprimands, mediation agreements have no expiration/expungement date, unless agreed to by both parties. Unlike suspensions, this option doesn’t result in lost work time and HR-driven legal processes that take weeks or even months to complete. And instead of HR making decisions, line managers and their mentors speak for themselves and find their own preferred solutions. There are other differences that may prove more important to Federal agencies and taxpayers. Mediated agreements are not grievable and do not precipitate EEO complaints. In fact, mediated agreements are commonly used to resolve grievances and EEO complaints. Having a trained and neutral mediator manage the conversation between supervisor and subordinate can change the tone and content of that conversation. Services like what we provide in Seattle have experienced remarkably high satisfaction rates concerning the mediation process and its fairness, despite the charged atmosphere accompanying these meetings. This is because, when done well, the parties address the issues behind the inappropriate behavior. 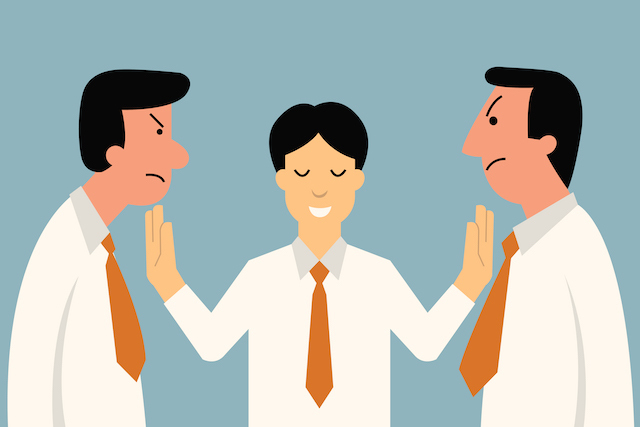 Confidentiality agreements obtained before the mediation begins, ensure that the parties speak their minds honestly. Representatives such as attorneys and union officials are welcome and often prove useful to the mediator and those they support. I’ve been volunteering as a mediator for the Seattle Federal Executive Board for almost 20 years now. As a former Labor Relations Specialist, I came into this field thinking that mediator was synonymous with manipulator. Parties were placed in separate rooms and the mediator shuttled between them working toward a deal. Face-to-face encounters are avoided and both sides are persuaded to compromise in the shadow of a judge or arbitrator who will make a decision for them should they fail. The new school of mediation (often referred to as the transformative or facilitative model) I studied is less intrusive. It lends itself especially well to conflicts arising from relationships… like neighbors, workplace disputes, and families. The success of this method of alternative dispute resolution are undeniable. An academic study funded by the EEOC reflects this. At the most basic level, mediators change two variables in conversations that haven’t led to satisfactory results in the past. We help people to speak less about the past and more about the future – which should be paramount in disciplinary actions other than demotion or removal. Secondly, a facilitative mediator helps people to address their “interests”. At its most basic level, an interest is why, rather than what we want. In this manner, the parties in a mediation spend less time relitigating the past and characterizing others. Over a very few hours, the conversation changes to one that’s more collaborative and, therefore, productive. It is time for HR offices to become acquainted with mediation. Most HR Specialists I meet know little or nothing about this option. Most attorneys I’ve met only have experience with “shuttle” models that are commonly used to settle legal claims. Even EEO specialists who are used to referring cases to mediation are often ignorant as to the process used and the reasons it has proven amicable and cost-effective. Anecdotal instances of failure (often loudly proclaimed) are vastly outweighed by the many untold stories of success. As a client, I once had a bad experience with mediation and I know many others who have left the room with a foul taste in their mouths. While mediators often struggle to remain neutral (after all, we’re as human as our clients), the data concerning the new model doesn’t lie. Facilitative mediations are overwhelmingly successful in every measurement of satisfaction. The Equal Employment Opportunity Commission funded experiments with mediation as an alternative to its traditional complaint process. Those experiments (beginning with our Federal Executive Board in Seattle) were so successful on every front that they changed their complaint process and continue to do so. It’s time for the Office of Personnel Management to follow suit. I suspect that many millions of dollars now spent on traditional discipline could be saved by offering this alternative. Seldom, if ever, do a supervisor and employee leave worse off than when they walked in. At worst (for instance when the accused employee denies having done what is basis for discipline), the parties leave the mediation room and continue down the traditional path of discipline and potential push-back. Far more often, they leave with a better understanding of one another and a binding written agreement as to what can be expected in the future. Most of us who follow Federal labor and employee relations haven’t seen meaningful changes regarding Federal disciplinary processes since the Lloyd Lafollette Act of 1912. Much has changed in the intervening century. Is It Probation If No One Gets Fired? Do Your Supervisors and Managers Know the Basics?